What makes a good helmet? Everyone has a different budget when it comes to buying a cycle helmet. If you’re willing to cough up the extra coin then you can expect the helmets to become lighter, better ventilated or have a better adjustable retention system. But never fear! You don’t have to spend a fortune to get something that will keep you safe. 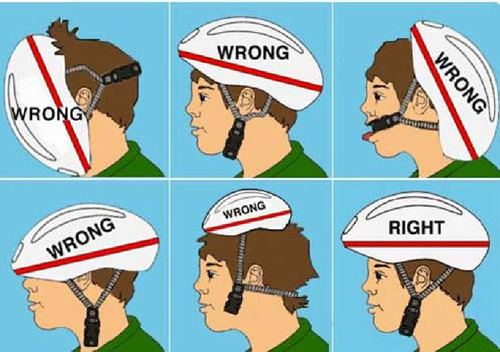 All helmets must conform to standards that guarantee a certain level of protection. The debate on whether helmets should be compulsory continues to rage on. No matter what side of the fence you’re on, it’s undeniable that you’re better protected in some circumstances when wearing a helmet. Have a read through this guide to get an idea of what you should be looking for. You want your helmet to strike that perfect balance between snug and secure. It doesn’t want to be so tight that it’s pinching you around the face. Meanwhile, if the helmet is too loose and you get into a crash, your head will still be moving around inside it. So you don’t want that either. Don’t be afraid to go into a shop to try some on. After all, it’s vitally important to get one that’s comfortable and safe. The main shell of most helmets is made out of expanded polystyrene. This will absorb the force of an impact if you ever hit one of those inconspicuous pot-holes. The outer shell holds the inner shell together and will also help to disperse the shock of a crash. Inside every helmet are pads and cloth that are designed to keep your head comfortable and absorb sweat on those more challenging rides. As you can probably guess, your helmet will not smell like a bed of roses after extensive use. You’ll want to ensure that the padding is removable so that it can be washed as necessary. The straps should be adjustable and easy to use so that you can keep the helmet in the correct position. The ‘Y’ piece straps will help you adjust the position of the helmet on each side of your head so that you can comfortably clip it all together at the chin strap. The head retention system is an adjustable harness at the back of the helmet that improves stability by grabbing the occipital bone at the back of your head. They are usually controlled by a wheel at the back of the helmet that can turned either way to tighten or loosen your back support. As you go up in price you can get varying levels of ventilation. Strategically placed vents are cut into the helmet so that your head can remain cool as you ride. If you find yourself becoming hot headed during a ride – and it’s not a result of road rage – then you may wish to get a well-ventilated helmet. If you’re shopping online, you can get a lot of great deals on bicycle helmets from retailers like Koo Bikes. They also supply a number of bike accessories such as locks, lights and air pumps if you’re in the market for something new. One final tip before you buy a helmet online; make sure that the helmet size matches your own head measurement to guarantee a helmet that ticks all the boxes.